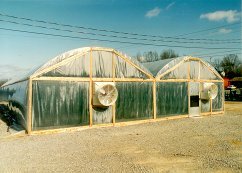 Morton's "G" series greenhouses are designed to give our the customers the flexibility to purchase the size of gutter-connected greenhouses to fit their growing needs. They are available in 20' bay widths and any length in 5' increments. The "G" series is an excellent choice in greenhouses where maximum side height is desired. These houses are used for a variety of purposes, including growing, as a retail sales house, or as a shade house for trees and taller plants. We will be glad to quote any size house, with or without accessories, that you would like. Benches: Available in two widths. either 4' or 6', the benches are ideal for pots, trays, or a variety of other needs. Design of the bench allows for adjustment in height to fit customers needs. Includes legs, wire supports, wire bench and connecting hardware. Available in 5' lengths. Trusses: Support trusses are offered as an option to the "G" series houses. We suggest adding them to each bow to increase the snow load of the house. They are made of 1 5/8", 16 gauge tubing. Connecting hardware is including. 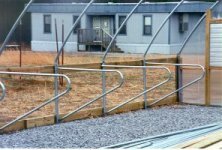 Gutters: The gutter is constructed of 18 gauge galvanized steel. Poly fastener is included for both wings of the gutter. Available in 5' or 10' lengths.